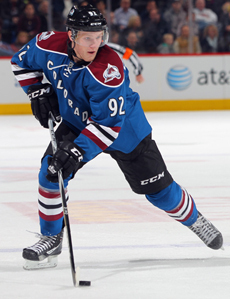 The Colorado Avalanche Hockey Club announced today that forward Gabriel Landeskog has been named team captain. Landeskog was appointed captain by Avalanche head coach Joe Sacco after Milan Hejduk informed the coaching staff that he has relinquished his role. Hejduk, who served as captain during the 2011-12 campaign, will remain as an assistant captain this upcoming season along with Paul Stastny. According to available research, at 19 years, 286 days, Landeskog is the youngest captain in NHL history. He is 11 days younger than Sidney Crosby, who was 19 years, 297 days when he was named captain of the Pittsburgh Penguins on May 31, 2007. Landeskog becomes just the fourth captain in Colorado Avalanche history, joining Joe Sakic, Adam Foote and Hejduk. The Stockholm, Sweden native is the 11th captain in the history of the Avalanche/Nordiques franchise and only the third European-born, following Hejduk and Peter Stastny. Landeskog captained the Kitchener Rangers (OHL) during his final season of junior hockey in 2010-11, becoming the first European captain in the 48-year history of the Rangers franchise. He was named captain at the age of 17 on Oct. 24, 2010, becoming the youngest player in 30 years to be named captain of the Rangers. At the international level, Landeskog recently served as an alternate captain for Team Sweden at the 2012 IIHF World Championship in Helsinki and Stockholm. He was also an alternate captain for Sweden at the 2011 IIHF World Junior Championship in Buffalo, N.Y.
Landeskog won the 2012 Calder Memorial Trophy as the NHL’s rookie of the year. Colorado’s first pick (second overall) in the 2011 Entry Draft, Landeskog finished tied for first among rookies with 52 points (22 goals / 30 assists) while appearing in all 82 games. He was awarded the rookie scoring title in a tie-breaker over Ryan Nugent-Hopkins (18g/34a) on the basis of more goals. Landeskog ranked second among league rookies in goals and was third in assists, making him the only player to rank among the top three rookies in all three categories. Landeskog also led all rookies in shots (270) and takeaways (58), while ranking second in plus/minus (+20), game-winning goals (5), power-play goals (6-tied) and hits (219). He is the second NHL rookie to ever surpass 20 goals and 200 hits in a season, joining Dion Phaneuf with Calgary in 2005-06. Landeskog led the Avalanche in games, goals, plus/minus, shots, hits and GWG (tied). He became the youngest player in franchise history to lead the team in goal scoring. Landeskog’s 270 shots were a franchise rookie record and the second-highest total by a rookie left wing in NHL history. He became the first Swedish-born teenager in NHL history to reach either the 20-goal or 50-point milestone.